The digital scans show that when first born the Tasmanian tiger looked like any other marsupial. But three months later, when they left the pouch, they had taken on the appearance of a puppy and continued to grow with a dog-like appearance. This has revealed important new information about how this unique extinct marsupial evolved to look so similar to the dingo, despite being very distantly related. The digital scans show that when first born the Tasmanian tiger or thylacine (Thylacinus cynocephalus) looked like any other marsupial. But three months later, when they left the pouch, they had taken on the appearance of a puppy and continued to grow with a dog-like appearance. The research, led by the University of Melbourne and Museums Victoria and in conjunction with an international team of scientists, is published today in Royal Society Open Science. The Tasmanian tiger was a marsupial, which raised its young in a pouch. Its resemblance to the dingo is one of the best examples of convergent evolution in mammals. This is where two species, despite not being closely related, evolve to look very similar. The Tasmanian tiger would have last shared a common ancestor with the canids (dogs and wolves) around 160 million years ago. Dr Christy Hipsley, Research Associate at the University of Melbourne and Museums Victoria, said after sequencing the Tasmanian tiger genome in 2017, this research fills one more piece of the puzzle on why they have evolved to look so similar to dogs. "This is the first digital development series of the Tasmanian tiger, Australia’s most iconic extinct marsupial predator," Dr Hipsley said. "Using CT technology we have been able to garner new information on the biology of this iconic species, and its growth and development." 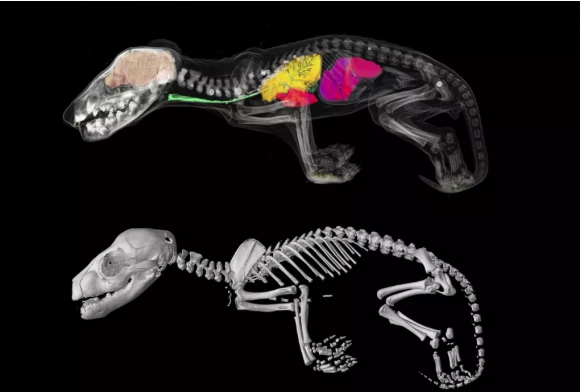 These scans show in incredible detail how the Tasmanian tiger started its journey in life as a joey that looked very much like any other marsupial, with robust forearms so that it could climb into its mothers pouch. But by the time it left the pouch around 12 weeks to start independent life, it looked more like a dog or wolf, with longer hind limbs than forelimbs. Once ranging throughout Australian and New Guinea, the Tasmanian tiger disappeared from the mainland around 3000 years ago, likely due to competition with humans and dingos. The remaining Tasmanian tiger population, isolated on Tasmania, was hunted to extinction in the early 20th century, with the last known individual dying at Hobart Zoo in 1936. PhD student and lead author on the paper Axel Newton said: "until now there have only been limited details on its growth and development. For the very first time we have been able to look inside these remarkably rare and precious specimens." Unable to study the living species, the team had to look to the 13 Tasmanian tiger joey specimens that exist in museum collections worldwide, including three from the collection of Museums Victoria. These joey specimens, representing five stages of postnatal development, were scanned using non-invasive X-ray micro-CT scanning technology to create high resolution 3D digital models, in which all their internal structures such as skeleton and organs could be studied. University of Melbourne Associate Professor Andrew Pask explains this was an incredibly effective technique to study the skeletal anatomy of the specimens without causing any damage to them. "This research clearly demonstrates the power of CT technology," Associate Professor Pask said. "It has allowed us to scan all the known Thylacine joey specimens in the world, and study their internal structures in high resolution without having to dissect or cause damage to the specimen. By examining their bone development, we’ve been able to illustrate how the Tasmanian tiger matured and identify when they took on the appearance of a dog." The study has also revealed the incorrect classification of two specimens held in the collection of the Tasmanian Museums and Art Gallery (TMAG). Instead, they are most likely to be quolls or Tasmanian devils, based on the number of vertebrate and presence of large epipubic bones (specialised bones that support the pouch in modern marsupials). TMAG Senior Curator of Vertebrate Zoology Ms Kathryn Medlock said that the museum had received many requests to dissect its pouch young over the years but requests were always refused. "One of the major advantages of this new technology is that it has enabled us to do research and answer many questions without destruction of the sample specimens," Ms Medlock said. "This is a significant advancement that also has an additional benefit of helping us to learn more about the identity of these specimens that have been in the TMAG collection for many years." An exciting outcome of the research is that the 3D digital Tasmanian tiger models are to be made publicly available as a resource for current and future researchers.